My teenage daughter, Miss Em, and I like to have a little girls night in every once in awhile. If you can believe it, Nate actually gives us pedicures while we watch a favorite movie. I thought a Girls Night In theme would be perfect for a gift basket to a best friend. I actually put it all together around the new KLEENEX® Betsey Styled Single Packs of tissue because I can never watch a chick flick without crying a little bit. 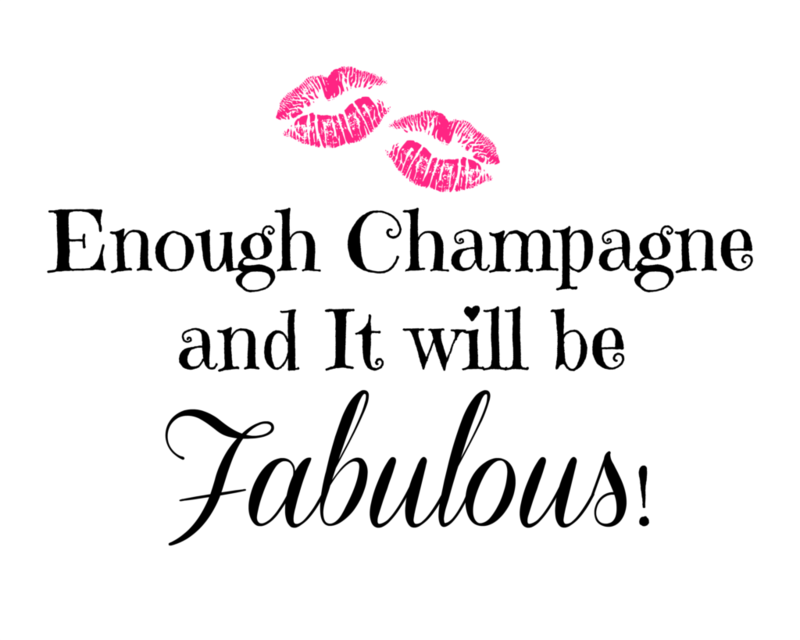 When I think of Betsey Johnson, I think of fun, frou frou, and pink, which is just like me! 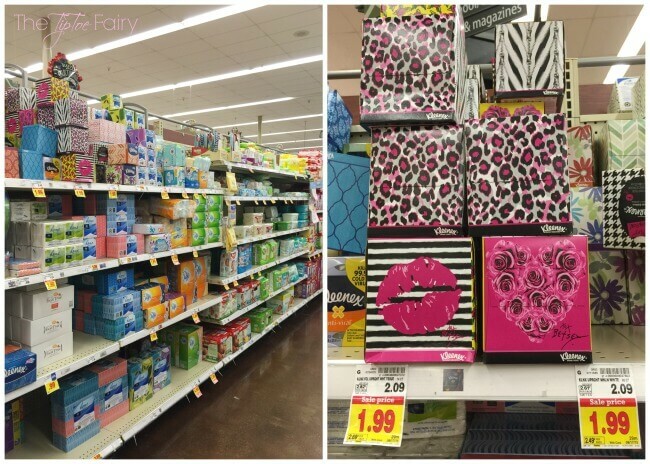 She’s one of my favorite designers, so I was thrilled to find KLEENEX® Betsey Styled Single Packs and the Betsey Styled Wallet 3 Packs both at Kroger. 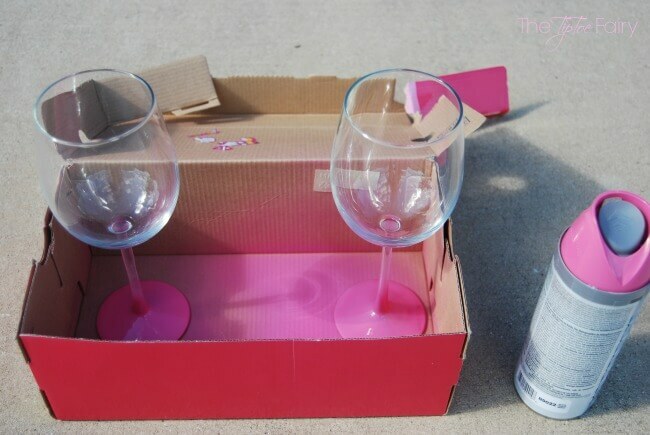 You’ll never believe how easy these wine glasses are to make. I simply bought single wine glasses at the store, and then spray painted the bottoms. Once, they were dry, I spray painted a clear coat so I could wash them without worrying the paint would come off. 1. 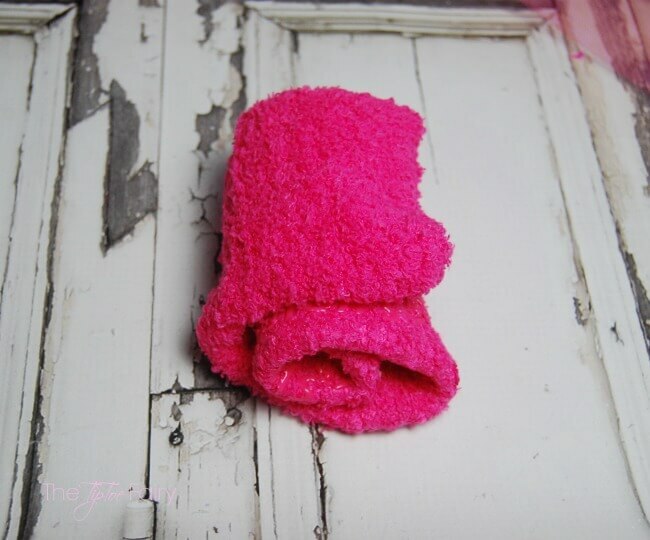 Take one fuzzy sock and wrap it up like the picture. 2. Next, on the lower half of the wrapped up sock, wrap about 2 ft of tulle around. Tuck the raw edge in the bottom of the rolled up sock. 3. Then, place it into the cupcake wrapper. 4. 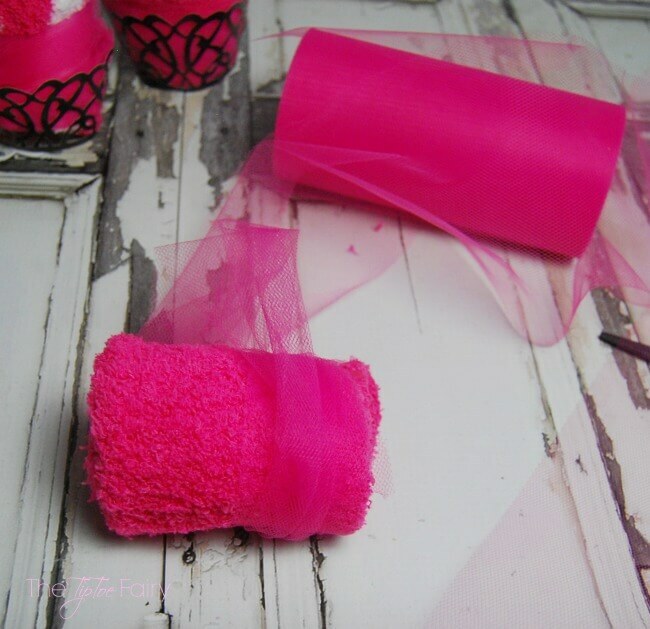 Pull the inside rolls of the “cupcake” up a little to look a little like frosting and tuck a bottle of nail polish in the very center to look a little bit like a cherry on top. Available in select Kroger and Kroger banner stores. Purchase two specially marked packages of Kleenex® Tissues in one transaction at Kroger stores and receive a reward code valid for a $5 Visa Digital Rewards Virtual Account via text message between 4/1/15 – 4/30/15. Reward code must be activated by 5/31/15 and is void if not activated by expiration date. Virtual Account expires 2 months from the date of activation and will be void if not used by the expiration date. Virtual Account can be used online wherever Visa debit is accepted for digital content purchase(s) up to $5 and use governed by terms in Account holder Agreement https://www.activaterewards.com/Kleenex/terms_and_conditions. Digital content may not be available for all devices. No cash value. Not for resale; void if sold or exchanged. Cannot be replaced if lost or stolen. Not valid with any other offer. Offer and Virtual Account valid only in the U.S., excluding U.S. territories. For full participation instructions, go to www.activaterewards.com/Kleenex. Issued by MetaBank®, Member FDIC, pursuant to a license from Visa U.S.A. Inc. Digital Reward is powered by Fandango Loyalty Solutions, LLC. ©2015 Fandango Loyalty Solutions, LLC. All Rights Reserved. Find the recipe for easy Pomegranate Lemonade HERE! I hope you enjoyed my gift basket idea today. You can find more gift inspiration with KLEENEX® HERE. Who will you create a gift basket for? Now those are some cute Kleenex boxes that add so much color to a room! Perfect for a girl’s room also. What a great idea and always enjoy learning something new Thank you! 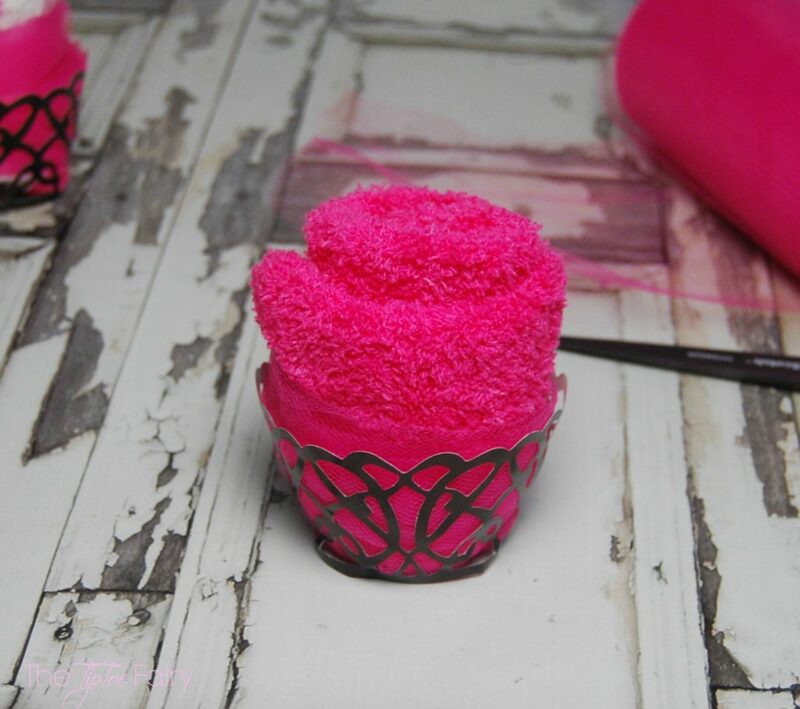 The fuzzy sock cupcakes are too cute! These would make a fun mother’s day gift, too! Wow, this is such a creative idea. 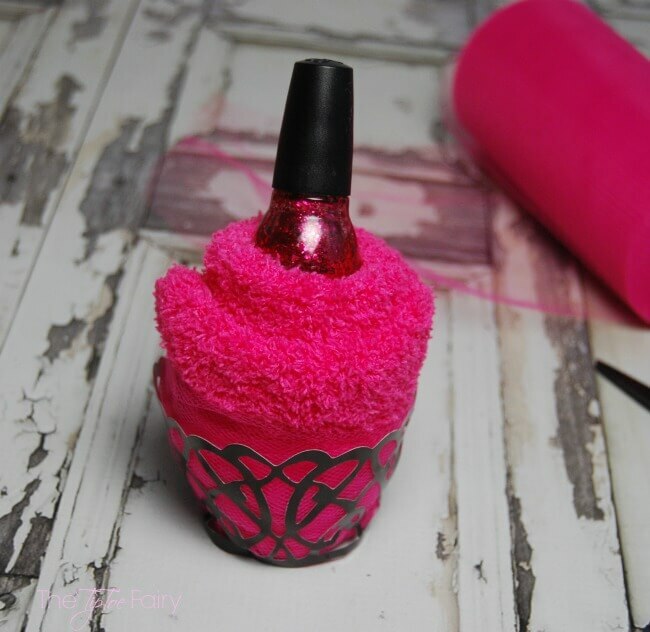 I like how you wrapped the socks up around the nail polish! I love this as a gift, what a fun gift it would be to get! HINT HINT to my friends LOL Just kidding, I can give it and hopefully take party in it! 🙂 That’s the ticket! This gift basket is adorable! My friends would love it! I just bought some of the Betsey kleenex yesterday! Love them! Such a great idea! Love the sock cupcake, very creative. That is the perfect gift basket! I love the design on the tissue boxes and I am the same way about chick flicks and needing Kleenex for them. 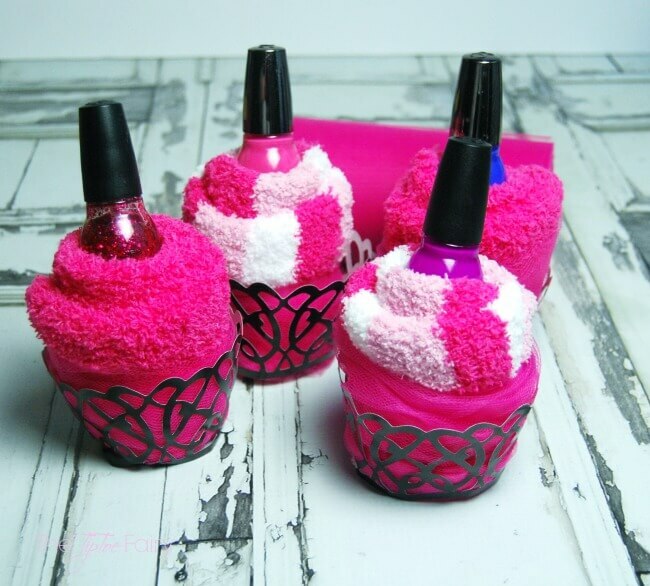 Love the sock cupcakes that is such a creative idea and way to give nail polish! This idea is too cute! I love a good girls night in. It saves money also which I really love. I hope you girls made a good time getting pampered! I need to go out and buy m Betsy Johnson Kleenex! She’s one of my favorite designers! I like your gift basket; especially the nail polish cupcakes; so cute!!! As a guy, I can’t really relate, but I’m sure you’d all enjoy yourself with all of these great items. Everyone needs some time to relax. What a fun idea. I feel like this would be perfect for a college reunion weekend or a bachelorette or wedding weekend. Wish I had a GNO on the calendar…too busy with my boys and I don’t think they would like to indulge in any mani-pedi’s with me! I love how adorable this gift basket is! I love how you rolled up those socks and put the polish inside, it’s adorable! 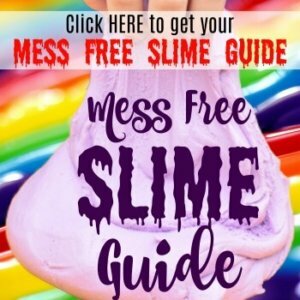 Thank you so much for the fun post! This is such an adorable idea! Super duper cute for girls night or even for just me hehehe I think this will be a great going into summer party idea. My girl friend loves nail color so she would love this. 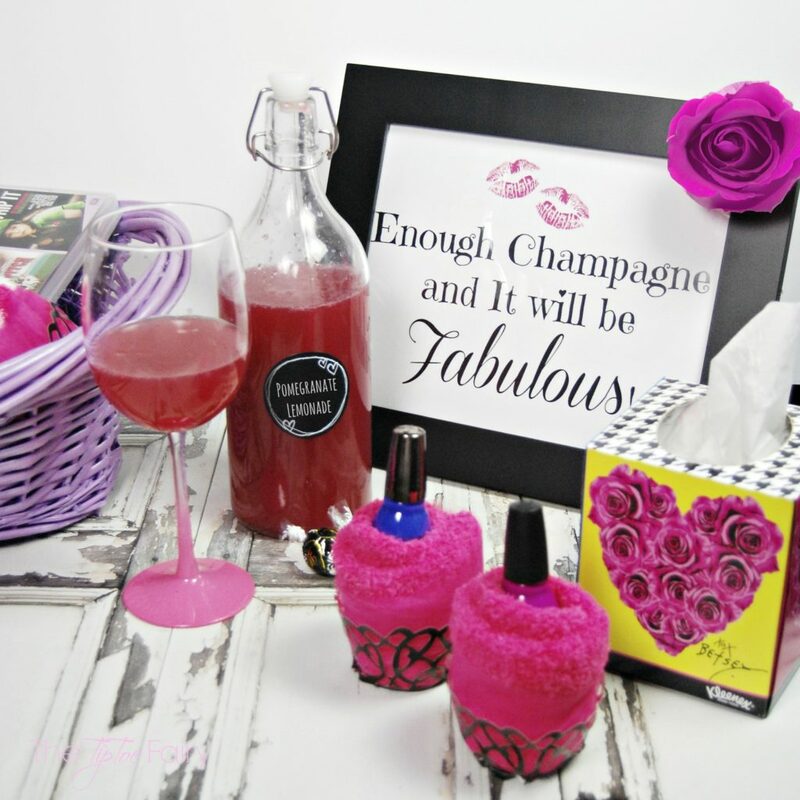 This all looks like the perfect addition to girls night and I love the champagne printable, so stinkin’ cute! 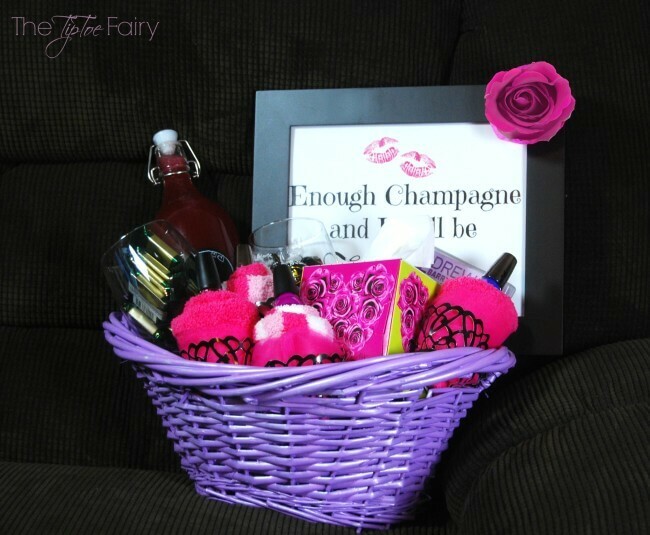 I’ll definitely be fixing up a basket like this for my next girls night with my besties! 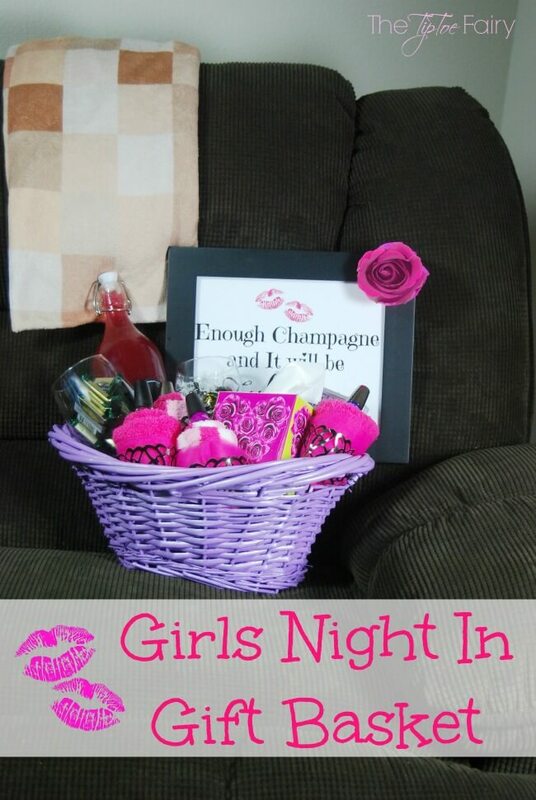 Such a great idea, this basket would be perfect to share with friends for a girls night in. I love the DIY details you added to it. Hope you all had a fun night. I love this idea! This would be great for a girls slumber party. Thank you for sharing. However, I had a hard time reading the article on my phone because the social media links to the left of the page cover part of the article. I even tried switching to the desktop version on my phone and that didn’t help. Maybe a chat with the designer could help fix this issue. I love the sock idea, but seems silly to give someone only 1 sock. Have you tried it with socks in one cupcake?